Myeloid-derived suppressor cells (MDSC) represent a unique cell population with distinct immunosuppressive properties that have been demonstrated to shape the outcome of malignant diseases. Recently, human hepatic stellate cells (HSC) have been reported to induce monocytic-MDSC from mature CD14+ monocytes in a contact-dependent manner. We now report a novel and unexpected mechanism by which CD14+HLADRlow/− suppressive cells are induced by catalase-mediated depletion of hydrogen peroxide (H2O2). Incubation of CD14+ monocytes with catalase led to a significant induction of functional MDSC compared with media alone, and H2O2 levels inversely correlated with MDSC frequency (r = −0.6555, p < 0.05). Catalase was detected in primary HSC and a stromal cell line, and addition of the competitive catalase inhibitor hydroxylamine resulted in a dose-dependent impairment of MDSC induction and concomitant increase of H2O2 levels. The NADPH-oxidase subunit gp91 was significantly increased in catalase-induced MDSC as determined by quantitative PCR outlining the importance of oxidative burst for the induction of MDSC. These findings represent a so far unrecognized link between immunosuppression by MDSC and metabolism. Moreover, this mechanism potentially explains how stromal cells can induce a favorable immunological microenvironment in the context of tissue oxidative stress such as occurs during cancer therapy. Since their early description, myeloid-derived suppressor cells (MDSC) have evolved to be understood as key regulators in various inflammatory and malignant conditions (1, 2). Currently, they are commonly regarded as heterogeneous, immature precursors of the myeloid lineage consisting of two distinct subtypes: granulocytic MDSC and monocytic MDSC (MO-MDSC) (3). Defined as CD14+HLA-DRlow/− cells in humans, MO-MDSC have been demonstrated to be of (clinical) importance in various malignant diseases by impairing antitumor immunity and facilitating tumor progression such as that observed for malignant melanoma and hepatocellular carcinoma. In this study, MO-MDSC have been demonstrated to effectively modulate antitumor immunity through suppression of T cell proliferation and induction of regulatory T cells (4, 5). The detrimental effects of MO-MDSC on treatment response of malignant diseases are exemplified in patients with hepatocellular carcinoma following radiofrequency ablation, where the incidence of recurrence was inversely proportional to the frequency of MO-MDSC (6). However, in contrast to cells isolated from malignant melanomas, primary hepatocytes are not capable of inducing MO-MDSC from mature CD14+ monocytes, suggesting that accessory cells or factors are required for differentiation (7). Hepatic stellate cells (HSC) are liver resident stromal cells (8, 9) that exhibit immunoregulatory functions such as the induction of regulatory T cells (10) or the control of lymphocytic chemotaxis by secretion of various chemokines such as CCL2 (11). In murine transplantation models, whole allogenic livers, containing a stromal cell population, engraft well, whereas hepatocytes were rejected (7, 12). However, in contrast to murine HSC (13) (14), MO-MDSC induction by human HSC (15) is dependent on cell–cell contact through CD44, a glycoprotein important for monocytic chemotaxis (16), suggestive of a previously unknown mechanism of MO-MDSC induction. In this study, we show that depletion of hydrogen peroxide (H2O2) by soluble or stromally expressed catalase drives the induction of MO-MDSC from human monocytes. These findings were unexpected because induction of MDSC has thus far been attributed to accumulation of reactive oxygen species (ROS) rather than to their detoxification (17). The reported mechanism demonstrates how closely metabolism and immune-response are interconnected and may explain how malignant diseases induce tolerance despite enhanced detoxification of ROS during antineoproliferative treatment. Human tissue and blood were obtained from patients attending the Queen Elizabeth Hospital (Birmingham, U.K.), after ethics committee approval and informed patient consent was received (Research Ethics Committee reference numbers 06/Q2708/1105 and 06/Q2708/38). Nondiseased liver tissue was obtained from either surplus donor tissue (i.e., tissue exceeding transplantation requirements) or surgical resections of liver tissue containing metastatic tumors. In the latter case, uninvolved tissue was taken several centimeters away from any tumor deposits. Human whole blood was either obtained from hemochromatosis patients undergoing venosection as part of their treatment or from healthy donors following ethics committee approval and informed consent. PBMCs were isolated by density gradient centrifugation over Lymphoprep gradient (30 min at 650 × g; Axis Shield, Dundee, U.K.). Ex vivo CD14+ monocytes were enriched using MACS, according to the manufacturer’s recommendations (Miltenyi Biotec, Bergisch Gladbach, Germany). T effector cells were enriched using a standardized bead-coupled isolation method, according to the manufacturer’s recommendations (Dynabeads, Life Technologies, Paisley, U.K.). MO-MDSC were defined as CD14+HLA-DRlow/−. HSC were isolated and cultured as described previously (11). In brief, HSC were isolated from normal or resected human liver by pronase/collagenase digestion, followed by buoyancy centrifugation. HSC were identified using autofluorescence and were >90% pure. HSC were plated in uncoated flasks in DMEM/16% FCS. Viability was confirmed by trypan blue exclusion. HSC were used at passage 3/4. The stellate cell line LX-2 (a gift from S. Friedman, New York, NY) (18), HSC, and the hepatoma cell line HUH7 (19) were grown in uncoated flasks and cultured until confluence. LX-2 cells were cultured in DMEM/2% FCS and HUH7 and were maintained in DMEM/10% FCS containing 1× nonessential amino acids (Sigma-Aldrich). Confluent cells were detached using enzymatic digestion (TrypLE; Life Technologies) and cultured in flat-bottom 6-well plates until confluence, with viability confirmed by trypan blue exclusion. Enriched blood-derived CD14+ monocytes (0.5 × 106/ml) were then coincubated for 3 or 5 d with confluent LX-2, HSC, or HUH7. In parallel experiments, CD14+ monocytes (0.5 × 106/ml) were incubated for 3 or 5 d in flat-bottom collagen-coated 6-well plates in the absence or presence of 500 U/ml catalase (Sigma-Aldrich). To block catalase activity, the competitive inhibitor hydroxylamine (Sigma-Aldrich) was introduced in increasing concentrations immediately prior to adding immunomagnetically enriched CD14+ monocytes. In other experiments, an IL-6R blocking Ab (clone 17506; R&D Systems, Abingdon, U.K.) was used to inhibit the effects of IL-6. The role of glutathione recovery during MDSC induction was investigated by adding N-acetylcysteine (NAC) (Sigma-Aldrich). Functional analysis of MDSC was performed using T cell proliferation assays. To determine the suppressive capacity of induced CD14+HLA-DRlow/− cells, 50,000 allogeneic T effector cells were cocultured in different ratios with CD14+HLA-DRlow/− cells (1:0, 1:1, 2:1, 4:1, and 8:1) for 3 and 5 d in the presence of anti–CD2/CD3/CD28-stimulating bead-coupled Abs (Miltenyi Biotec), according to the manufacturer’s recommendation. Prior to coculture, responder T effector cells were labeled with CellTrace Violet (Life Technologies). T cell proliferation was analyzed by CellTrace Violet dilution in successive cell divisions as measured by flow cytometry. In some experiments, the role of distinct immunosuppressive mechanisms was assessed by the introduction of blocking Abs (IL-10) and inhibitors (cyclooxygenase-2 [COX-2] and IDO): 5 μg/ml IL-10R blocking Abs (clone 3F9; Acris Abs, San Diego, CA), 20 μM NS398 (stock prepared in DMSO; Cayman Chemicals, Ann Arbor, MI), 500 μM 1-methyl-dl-tryptophan (1-MT; stock prepared in DMSO; Sigma-Aldrich). Induction of CD14+HLA-DRlow/− cells from monocytes was assessed by flow cytometry using a CyAn flow cytometer and Summit software (Beckman Coulter, Bucks, U.K.). For quantitative PCR (qPCR) and functional studies, cultured or MACS-enriched CD14+ cells were labeled as described prior to fluorescence activated cell sorting using an XDP cell sorter (Beckman Coulter). Viable cells were selected by Sytox blue exclusion (Life Technologies) with confirmed viability of ≥95%. mAbs are listed in Supplemental Table I.
Ex vivo monocytes and monocytes obtained from catalase cocultures were stained with a ready-to-use May–Grünwald- and Giemsa-staining solution (Merk-Millipore, Darmstadt, Germany) using a bond-automated staining-system (Tharmac, Waldsolms, Germany) in accordance with the manufacturer’s recommendation. Images were acquired using a Zeiss-Axiovert microscope (Zeiss, Jena, Germany). qPCR for cytokines/enzymes associated with MDSC immunosuppression (such as arginase and IL-10) and for analysis of oxidative stress (NADPH-oxidase subunits) was performed as described previously (20). Total RNA was extracted from purified monocytes and CD14+ HLA-DRlow/− cells ex vivo and after coculture with purified catalase using the RNeasy mini kit (Qiagen, Hilden, Germany) and purity determined spectroscopically. The extracted RNA was reverse transcribed using PCR Brilliant III Ultrafast SYBR Green (Agilent Technologies, Böblingen, Germany) and transcript levels quantified by real-time PCR using a Step One real-time PCR system (Applied Biosystems, Carlsbad, CA). Targeted genes and gene-specific primers are detailed in Supplemental Table II. For quantification of catalase mRNA levels, total RNA was isolated from cultured HSC, LX-2 cell line, and the hepatoma cell line HUH7 using an RNeasy kit (Qiagen). Purity of the mRNA was determined using a Nanophotometer (Implen). A total of 1 μg RNA was reverse transcribed to cDNA using the Transcriptor First Strand Synthesis kit (Roche Diagnostics). Real-time PCR was carried out in triplicate for each sample using a Roche Lightcycler 480 with data normalized to 18S. The primers were purchased from Life Technologies (TaqMan probes: catalase Hs00156308_m1 and 18S Hs99999901_s1). Cells (HSC, LX-2, or HUH7) were detached using TrypLE (Life Technologies) and homogenized in CelLytic M (Sigma-Aldrich) lysis buffer containing a protease inhibitor mixture (Complete ULTRA; Roche) and DNase I (Roche) and maintained under continuous agitation at 4°C for 30 min. Samples were centrifuged at 21,200 × g for 1 min at room temperature to clarify the supernatant. Protein concentration was determined by Bio-Rad DC protein assay with BSA as a standard. Solubilized proteins (20 μg) were separated by SDS-10% PAGE, and proteins were transferred to nitrocellulose (Hybond, Amersham Biosciences). Membranes were then blocked with 5% nonfat milk in PBS-0.05% Tween and then incubated with a rabbit-anti-human catalase Ab overnight at 4°C (1 μg/ml ab16731; Abcam). After several washes, membranes were incubated with a peroxidase-conjugated Ab (anti-rabbit HRP, 1:2500; DakoCytomation). Immunoreactivity was visualized using Pierce ECL Western blotting substrate and CL-Xposure film (Thermo Scientific). Membranes were then stripped and reprobed with mouse-anti-human β-actin (1/20,000; Sigma-Aldrich). Band intensities were quantified using ImageJ (version 1.47; National Institutes of Health, Bethesda, MD). H2O2 levels in supernatants of cocultures were quantified using the AMPLEX Ultra Red assay. Samples were incubated with AMPLEX Ultra Red reagent (200 μM; Life Technologies) and 2 U/ml HRP (Sigma-Aldrich). Detection of the fluorescent product resorufin was measured in a BioTek plate reader with excitation and emission wavelengths of 530 and 590 nm, respectively (slit widths 25/35 nm). Semiquantitative immunosorbent assessment of cytokine expression was performed on cell-free supernatant obtained from cell cultures using a Proteome Profiler Human Cytokine Array Kit/ARY005 (R&D Systems). Proteome profiling was performed in accordance with the manufacturer’s recommendation. Normally distributed continuous variables were expressed as mean (SD), and continuous variables with skewed distribution were expressed as median (range). Differences in means, medians, and correlation analyses were evaluated with parametric and nonparametric tests (one-tailed Student or paired t test, Pearson test, and ANOVA calculation). All statistical analyses were performed using GraphPad Prism Version 5 (GraphPad Prism Software, San Diego, CA). A p value < 0.05 was considered significant. HSC have been recently demonstrated to induce monocytic MDSC from mature peripheral blood monocytes in a cell-cell-contact–dependent manner (15). We speculated that this might be due to a microenvironmental change of metabolites that accumulate during the monocytic oxidative burst. A likely candidate was determined to be H2O2, which is produced at high levels during monocyte activation (21) and which is an important metabolite for the production of nitric oxygen species by monocytic myeloperoxidase (22). Incubation of purified peripheral blood CD14+ monocytes with catalase led to a significant increase of CD14+HLA-DRlow/− cells, with maximal induction at 500 U/ml (data not shown). The median frequency of CD14+HLA-DRlow/− cells within the monocyte population treated with catalase was significantly higher than that of untreated monocytes at day 3 and was sustained following 5 d of incubation (Fig. 1A, 1B). This cell population had a similar phenotype to MDSC induced by cocultures of monocytes with LX-2 or HSC as demonstrated by Höchst et al. (15). We therefore cocultured monocytes with LX-2 cells and observed a similar induction of a CD14+HLA-DRlow/− phenotype that reached similar levels to that observed with catalase coculture at day 5 (Fig. 1B). CD14+HLA-DRlow/− cells expressed CD11b and CD33 but lacked the maturation markers CD80 and CD86 irrespective of the method of induction (Fig. 1C). This population of monocytes was phenotypically identical to ex vivo monocytes as demonstrated by cytospins following May-Grünwald-Giemsa staining (Supplemental Fig. 1) and expressed CD163. Of note, CD163 is a marker indicative of M2 polarization that is also present on monocytic IDO+ MDSC in patients suffering from graft-versus-host disease after allogenic hematopoetic stem cell transplantation (data not shown) (20). This effect was not observed when CD14+ monocytes were cocultured with the hepatoma cell line HUH7 (data not shown). Of note, monocytes kept in coculture with catalase for 5 d displayed a viability of ≥95% as confirmed by Stytox blue exclusion on flow cytometry (Fig. 1D). Culture of peripheral blood monocytes with catalase or LX-2 cells induces an MO-MDSC–like phenotype. 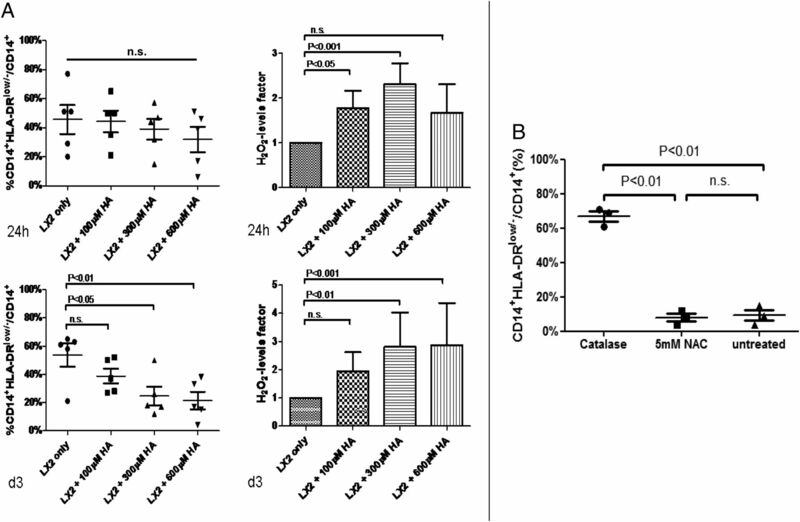 (A and B) Increased percentage of CD14+HLA-DRlow/− cells in the monocyte gate following coincubation with purified catalase or LX-2 cells. Results from eight independent experiments with 3 d of catalase coculture (A) and from five independent experiments with 5 d of catalase treatment (B). Monocytes were analyzed for HLA-DR expression by flow cytometry at both time points. Compared with untreated monocytes catalase induced a significantly higher frequency of CD14+HLA-DRlow/− at both time points (day 3: 55%, interquartile range (IQR) 26–77% versus 2% IQR 1–6%, p = 0.0009; day 5: 41%; IQR 37–48% versus 1%; IQR 0–1%, p = 0.004). (C) Comparison of cell surface markers on monocytes cocultured with hepatic catalase or the LX-2 cells for 3 d as analyzed by flow cytometry. Mean fluorescence intensity of CD11b, CD33, CD80, and CD86 are shown. Representative plots of CD14+HLA-DRlow/− and CD14+HLA-DR+cells within the monocyte gate after 3 d of culture are shown alongside ex vivo–isolated populations. Gray plots: isotype control. (D) Representative plot of five independent experiments demonstrating that 5 d of monocyte/catalase coculture did not affect viability as demonstrated by violet exclusion (Sytox blue). The counter plot was gated on the monocyte population as defined by forward light scatter and side scatter (of light). The scatter plot (live-dead) was gated on CD14+ cells irrespective of their HLA-DR expression. To confirm that MDSC induced by catalase were functional, we assessed the immunosuppressive capacity of CD14+HLA-DRlow/− population obtained from catalase cocultures. Allogenic effector T cells were cocultured with CD14+HLA-DRlow/− cells in increasing ratios (Fig. 2A). Significant suppression of proliferation was observed when CD14+HLA-DRlow/− cells were cocultured with T cells both for 3 or 5 d and maintained >80% suppressive capacity up to a ratio of 4 T cells:1 CD14+HLA-DRlow/− cell (Fig. 2B, 2C). 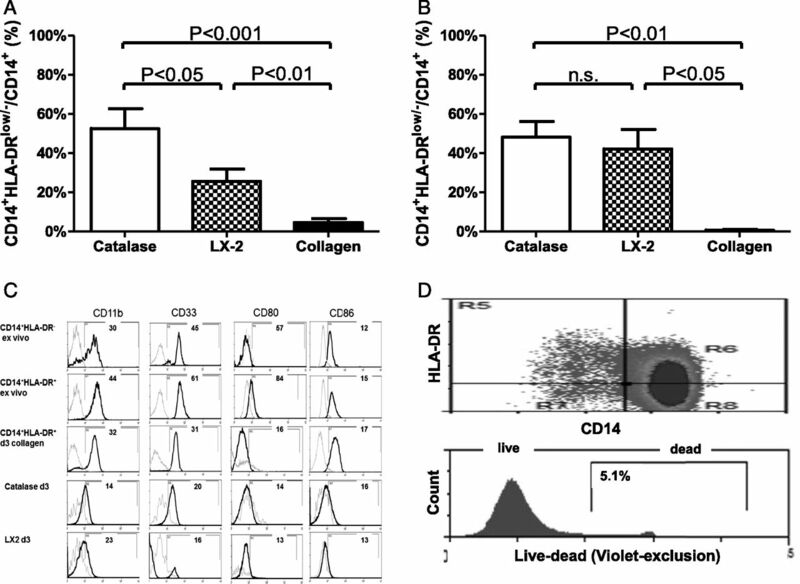 Catalase-induced CD14+HLA-DRlow/− cells possess immunosuppressive properties typical of MDSC. (A–C) CD14+HLA-DRlow/− derived from monocytes cocultured with catalase significantly suppressed T cell proliferation up to a ratio of 1 MDSC:8 T effector cell (A). Proliferation was analyzed after 3 d (B) and 5 d (C), and the percentage of cells proliferating was compared with maximal proliferation (T cells cultured alone). Representative histograms (A) or cumulative results of 8 (B) and 3 (C) independent experiments are shown. The mechanism by which CD14+HLA-DRlow/− cells suppress T cell proliferation was investigated by qPCR for gene products associated with MDSC function (Fig. 3A). The expression of IDO was significantly increased in CD14+HLA-DRlow/− cells following 5 d in culture with catalase (>1000-fold; p < 0.002). IDO has been shown to deplete tryptophan and produce kynurenine leading to a downregulation of the ζ chain of the CD3 complex on T cells and is linked with MO-MDSC suppressive capacity (20, 23). Catalase induced MDSC exert immunosuppression via an IDO-dependent mechanism. (A) Relative qPCR for cytokines/enzymes involved in MDSC-mediated immunosuppression suggested a role for IDO and IL-10. The expression of mRNA species in CD14+HLA-DRlow/− cells obtained from catalase coincubation were expressed as fold change relative to their expression on ex vivo CD14+ cells. Results from five independent experiments. N.D., not detectable. *p < 0.05. (B and C) Introduction of blocking substances and neutralizing Abs into T cell proliferation-assays. Addition of NS398 (COX-2 blockade) (B) or IL-10R blocking Abs (C) did not significantly reduce the suppression of T cell proliferation, whereas introduction of the IDO inhibitor 1-MT resulted in significantly increased T cell proliferation when compared with control proliferation-assays at MDSC:T cell ratios of 1:2 (p = 0.0045) and 1:4 (p = 0.0199). (D) Proliferation was analyzed after 3 d, and the percentage of cells proliferating was compared with maximal proliferation (T cells cultured in the absence of CD14+HLA-DRlow/− cells). Cumulative results of three independent experiments are shown. White bars indicate untreated controls, and black bars indicate addition of IL-10R blocking Abs (B), NS398 (C), and 1-MT (D), respectively. To determine whether IDO or IL-10 are involved in T cell suppression by CD14+HLA-DRlow/− cells, we introduced either 1-MT (IDO blockade) or an IL-10R blocking Abs or NS398 (COX-2-blockade) into our T cell proliferation-assays. Neither IL-10R blocking Abs nor NS398 had an effect on T cell proliferation (Fig. 3B, 3C). Consistent with the qPCR data, the blockade of IDO with 1-MT decreased the suppressive capacity of CD14+HLA-DRlow/− (Fig. 3D). Alleviation of suppression by 1-MT was significant at a ratio of 1:2 and 1:4 CD14+HLA-DRlow/− cell:T cell with a 2.9-fold increase in T cell proliferation at a ratio of 1:4. 1-MT failed to significantly enhance T cell proliferation at a MDSC per T cell ratio of 1:1. Activated HSC are known to respond to oxidative stress (24). Catalase expression by primary human HSC and by the human HSC cell line LX-2 was assessed by qPCR and western blot, and compared with the hepatoma cell line HUH7. All three cell types studied expressed catalase both at the transcriptional and translational level (Fig. 4A, 4B). However, the HUH7 cell line displayed the highest levels of catalase both in qPCR and Western blot (Fig. 4A, 4B) compared with LX-2 cell line and HSC. Induction of CD14+HLA-DRlow/− by stromal cells is dependent on cell–cell contact and correlates with extracellular H2O2 levels. (A and B) Catalase expression in HSC, LX-2, and a hepatoma cell line. (A) Relative gene expression (mRNA) of catalase in cultured HSC, LX-2, and HUH7 cell lines. Data are the mean of three independent experiments. In this study, HUH7 cell lines express the highest levels of catalase-mRNA (HSC versus HUH7, p = 0.0059; LX-2 versus HUH7, p = 0.0039; HSC versus LX-2, NS). (B) Western blots for catalase expression in cultured HSC, LX-2, and HUH7. Blot is representative of three experiments. Relative intensity (upper graph) and density (lower graph) was calculated relative to that of β-actin. Graphs represent the mean of three independent experiments. Relative intensity of catalase in HU7 cell line was significant higher as compared with HSC (p = 0.0107) and to LX-2 cell line (p = 0.0362). There was no significant difference between HSC and LX-2 cell line as far as relative intensity is concerned. There was no significance as far as the density of catalase expression is concerned. (C) Physical separation of monocytes from LX-2 cells results in a reduced frequency of CD14+HLA-DRlow/− cells and increased levels of H2O2. Monocytes were cultured for 3 d with confluent LX-2 either in direct contact or separated by non–cell-permissive Transwell inserts. The frequency of CD14+HLA-DRlow/− cells within CD14+ monocytes was analyzed by flow cytometry and was significantly lower in the Transwell culture compared with those in direct contact on day 3 (23 ± 22.7 versus 54 ± 18.4% at day 3; p = 0.03). 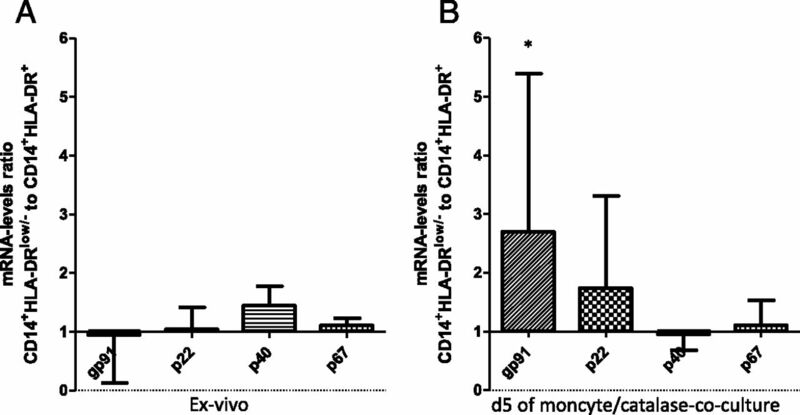 The frequencies of MDSC are expressed as percentage of CD14+HLA-DRlow/− cells in monocyte gate. Results from three independent experiments. Gating strategy according to Fig. 1D. Relative H2O2 levels were measured at different time points (24 h and day 3) by fluorometric detection and were significantly increased after 24 h of coculture but not on day 3 (24 h: 1.28- ± 0.18-fold, p = 0.0005; day 3, 1.06- ± 0.21-fold, NS). Induction of MDSC from peripheral blood monocytes by HSC has been demonstrated to be dependent on cell–cell contact (15). We therefore hypothesized that the effective concentration of catalase required for induction of CD14+HLA-DRlow/− cells from ex vivo monocytes can only be achieved when monocytes are in close proximity to catalase-expressing cells. Monocytes were therefore either cocultured on confluent LX-2 cells or separated by a Transwell membrane to prevent cell–cell contact, and the frequencies of CD14+HLA-DRlow/− cells and H2O2 levels were assessed at 24 h and day 3. Monocytes cultured in Transwell inserts showed a significant lower frequency of induced CD14+HLA-DRlow/− cells when compared with monocytes in contact with LX-2 cells (Fig. 4C) associated with significantly higher levels of H2O2 at 24 h but not day 3 of culture (Fig. 4C). To confirm that the increased frequencies of CD14+HLA-DRlow/− cells resulting from coculture of peripheral blood monocytes with HSC was a direct result of H2O2 depletion by catalase, we inhibited catalase with the competitive inhibitor hydroxylamine (Fig. 5A). Fewer monocytes cocultured with LX-2 cells in the presence of hydroxylamine differentiated into CD14+HLA-DRlow/− cells at day 3 compared with monocytes cocultured without hydroxylamine. This response was dependent on the concentration of the inhibitor (Fig. 5A) with a significant decrease in MDSC induction observed at a concentration of 300 μM hydroxylamine (Fig. 5A). This decrease in CD14+HLA-DRlow/− frequency was associated with a significant increase of H2O2 levels (Fig. 5A). To determine whether this phenomenon was specific to H2O2 or was related to a more general detoxification of ROS, we investigated whether the increase in the CD14+HLA-DRlow/− population could be induced by enhanced recovery of glutathione. NAC, which has been demonstrated to regenerate reduced glutathione (25), was introduced into the cultures and after confirming that NAC itself was not toxic at a concentration of 5 mM (data not shown), enriched monocytes were cocultured with 500 U/ml catalase, 5 mM NAC, or left untreated. Following 3 d of incubation, the frequency of CD14+HLA-DRlow/− cells within the monocyte population was increased by catalase treatment, whereas the addition of NAC had no effect (Fig. 5B). Addition of the catalase inhibitor hydroxylamine impairs induction of CD14+HLA-DRlow/− cells by LX-2 with concomitant increased levels of H2O2. Monocytes were cultured for 3 d on confluent LX-2 cells with various concentrations of hydroxylamine (HA) added as indicated (A). Relative H2O2 levels were measured by fluorometric detection, and the frequency of CD14+HLA-DRlow/− cells within CD14+ monocytes was analyzed by flow cytometry at different time points (24 h and day 3). A significant reduction in the fraction of CD14+HLA-DRlow/− cells following introduction of HA was achieved at a concentration of 300 μM (25 ± 15.1 versus 54 ± 18.4% if left untreated at day 3; p = 0.03). (B) Addition of NAC did not promote the induction of CD14+HLA-DRlow/− from monocytes. Monocytes were incubated with 500 U/ml catalase, 5 mM NAC, or left untreated, and the frequency of CD14+HLA-DRlow/− cells within the CD14+ monocyte population was analyzed by flow cytometry following 3 d of coincubation and expressed as the percentage of CD14+ cells in the monocyte gate (catalase, 67 ± 5%; NAC, 8 ± 4%; untreated, 9 ± 6%; catalase versus NAC, p = 0.0004; catalase versus untreated, p = 0.0016; NAC versus untreated NS). Frequency of CD14+HLA-DRlow/− cells within CD14+ monocytes was analyzed by flow cytometry. Results from three (A) and five (B) independent experiments. Gating strategy according to Fig. 1D. Because H2O2 may also function as a second messenger [e.g., in mitogenesis (26)], we hypothesized that increased frequencies of CD14+HLA-DRlow/− cells might be a consequence of O2 sensing and detoxification of H2O2 by catalase. To test this hypothesis, we analyzed the transcription of various subunits of the NADPH oxidase by qPCR in matched CD14+HLA-DR+ and CD14+HLA-DRlow/− cells prior to and following 5 d of exposure to catalase (Fig. 6). Of the four candidate genes examined, only gp91 showed a significant upregulation on CD14+HLA-DRlow/− cells at day 5 of exposure, a subunit that has been demonstrated to activate hypoxia-inducible factor-1 (27). Induction of CD14+HLA-DRlow/− cells by catalase involves gp91 as revealed by qPCR for NOX subunits. Expression levels of mRNA species from CD14+HLA-DRlow/− cells obtained ex vivo and from catalase cocultures (dsu 5) are expressed as fold change and relative to expression on matching CD14+HLA-DR+ cells. Following exposure to catalase CD14+HLA-DRlow/− cells displayed a significant increase in gp91 mRNA levels (2.7 ± 2.7-fold; p = 0.02). 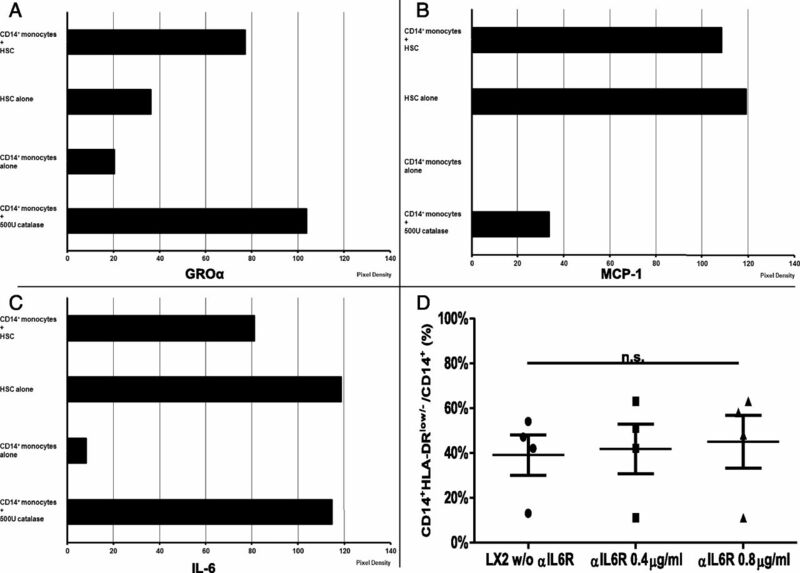 Comparison of mRNA levels of ex vivo CD14+HLA-DRlow/− to CD14+HLA-DR+ cells (A) and comparison of mRNA-levels of CD14+HLA-DRlow/− to CD14+HLA-DR+ cells (B) following 5 d of catalase coculture. Targeted genes are depicted on the x-axis. Results from five independent experiments. *p < 0.05. It has recently been demonstrated by Höchst et al. (15) that induction of CD14+HLA-DRlow/− cells relies on close cell–cell contact, although it is unclear what role, if any, cytokines play in this process. We used a semiquantitative immunosorbent assay (proteome-profiler) to compare supernatants obtained from HSC cultured with or without monocytes, or with matched monocytes cultured in the absence or presence of catalase for 5 d (Fig. 7A, 7B). Supernatants were analyzed for a total of 36 cytokines and chemokines and when compared with untreated monocytes, cells cocultured with HSC or catalase showed increased secretion of growth-related oncogene-α, MCP-1, and IL-6 (Fig. 7A–C). IL-6, however, showed the most pronounced difference in monocytes cocultured with catalase compared with monocytes left untreated (Fig. 7D). Moreover, monocytes cocultured with catalase displayed enhanced secretion of MIP-1α and MIP-1β, which was not observed in monocytes cocultured with HSC or left untreated (Supplemental Fig. 2). Because IL-6 has been demonstrated to be involved in the induction of MDSC (28), we speculated whether IL-6 may participate in the catalase-dependent induction of MDSC. Therefore, an IL-6-R blocking Ab was added to monocyte/LX-2 cultures at increasing concentrations (Fig. 7D). At day 5, cocultured monocytes were then analyzed for the frequency of CD14+HLAlow/− cells by flow cytometry (Fig. 7D). However, even when used at a concentration of 8 μg/ml, the addition of IL-6R blocking Ab did not lead to a significant decrease of CD14+HLA-DRlow/− cells when compared with monocytes cocultured with LX-2 cells in the absence of Ab blockade (Fig. 7D). 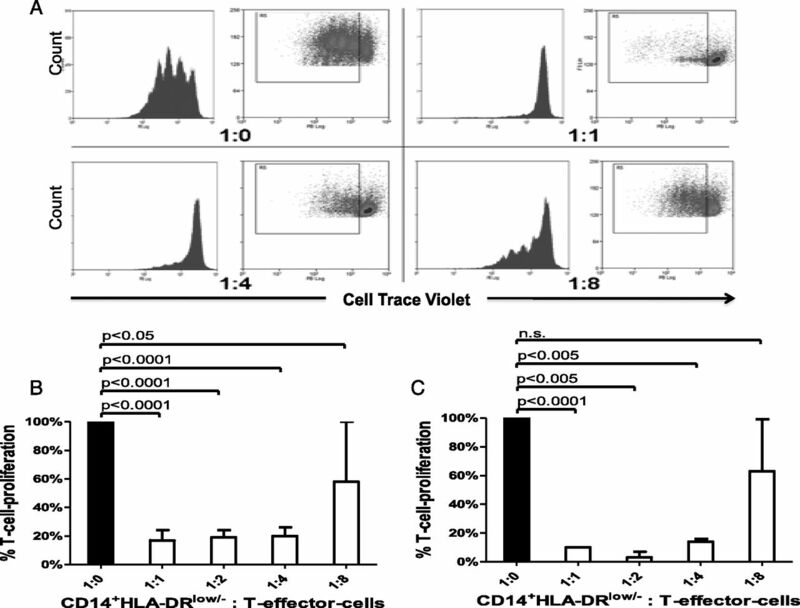 Induction of CD14+HLA-DRlow/− cells by catalase is independent of IL-6. (A–C) Proteome profiling shows an increase of growth-related oncogene-α (GRO-α) (A), MCP-1 (B), and IL-6 secretion (C) of both hepatic stellate cells and monocytes cultured with catalase compared with monocytes left untreated. A photograph of the array can be found in Supplemental Fig. 2B, 2D. (C) A marked difference in IL-6 secretion was observed for untreated monocytes compared with monocytes coincubated with 500 U/ml catalase or with confluent HSC. Monocytes cocultured either with catalase or on HSC showed a pixel density of 115 and 81, respectively, whereas monocytes showed a pixel density of 8. Pixel density is depicted on the x-axis. (D) Coculture of monocytes with LX-2 in the presence of absence of IL-6R blocking Abs. Monocytes were added to confluent LX-2 and cultured for 5 d with 0.4 or 0.8 μg/ml IL-6R blocking Ab or in the absence of blocking Ab (w/o αIL6R). Data expressed as percentage of CD14+HLA-DRlow/− cells in monocyte gate, results from four independent experiments. Gating strategy according to Fig. 1D. Enhanced metabolism and oxidative stress are hallmarks of various inflammatory and malignant conditions (29–31). However, our understanding of how this metabolic imbalance may affect the immune response especially in tumors is still fragmentary. A number of studies indicate that ROS is crucial for the induction/maintenance of immunosuppression (32–34). For example, murine MDSC have been shown to mature to macrophages in the presence of GM-CSF if ROS are depleted (17). However, it remains unclear how the differentiation of immune cells, most notably cells of monocytic origin, may affect the responsiveness to ROS. It is conceivable that accumulation of endogenous ROS such as H2O2 may result in blockade of differentiation of immature myeloid cells while also being necessary to maintain functionality in more mature myeloid cells. Monocytes demonstrate marked plasticity and can differentiate into distinct functional lineages important for the rejection of malignant diseases, most notably monocytic dendritic cell and macrophages (35, 36). Upon activation, they undergo oxidative burst with enhanced H2O2 production which is required for monocytic myeloperoxidase to allow nitrosylation of tyrosine-groups and efficient phagocytosis (22). Early studies also indicate that H2O2 may function as second messenger in human monocytic differentiation: in combination with GM-CSF, H2O2 has been shown to affect the differentiation of monocyte-derived macrophages (37). We report a previously unrecognized pathway in which the induction of MDSC from monocytes is promoted by catalase-dependent depletion of extracellular H2O2. Our findings both in primary human HSC and the LX-2 cell line provide evidence that this pathway operates in HSC mediated MDSC induction. Further experiments with non–cell-permissive Transwell inserts showed that detoxification of H2O2 by LX-2 cells was contact-dependent consistent with the findings of Höchst et al. who reported that HSC can induce MDSC differentiation of monocytes bound via CD44 (16). This may explain why HUH7 cells are unable to induce MDSC despite expressing high levels of catalase because CD44 is absent from noninfected HUH7 cells (38, 39). Of note, the concentration of purified catalase used in our monocyte cultures is only likely to be achieved locally when cells are in close proximity (see Fig. 4C). Through this mechanism, HSC can exert a local control of monocyte-driven inflammation, possibly via both CD44 and catalase, which may serve to limit the extent of tolerance induction. We observed that the induction of MDSC by hepatic catalase was independent of cytokines including IL-6 and the greater transcription of gp91 on catalase-induced MDSC compared with monocytes rather suggests that this mechanism depends on O2 sensing. Interestingly, gp91 activates hypoxia-inducible factor-1 (27), which has been shown to promote the differentiation of MDSC in response to hypoxia (40). Consistent with this hypothesis, the frequency of catalase-induced MDSC was inversely correlated with H2O2 levels. Local levels of H2O2 are important in inflammatory and wound healing responses, and local tissue-scale gradients of H2O2 mediate the initial recruitment of leukocytes during wound healing (41). Our findings provide another role for local changes in ROS such as H2O2 in determining the outcome of tissue inflammation (42). In contrast to the study by Höchst et al. 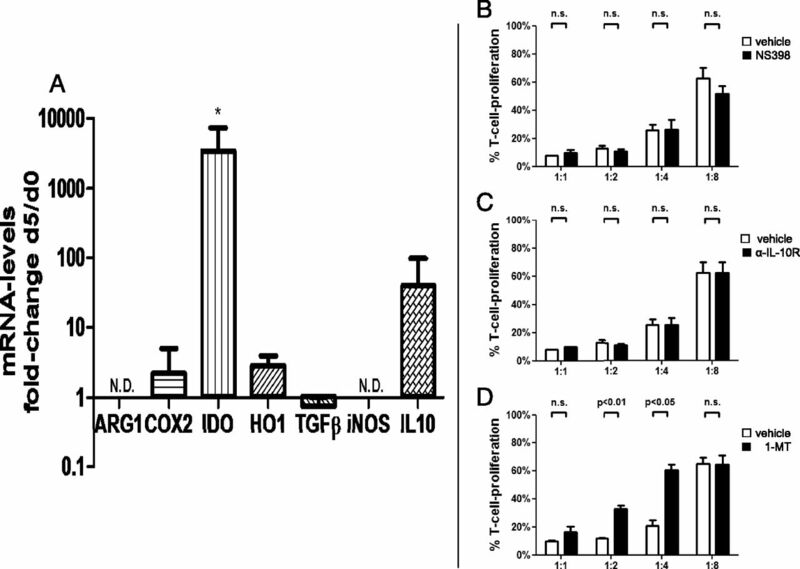 (15), MDSC induced by purified catalase did not express arginase, but high levels of IDO, which indicates that HSC may provide additional signaling shaping the properties of MDSC induced from monocytes. Moreover, an IDO blocker 1-MT reduced the suppressive effect on T cell proliferation at a MDSC per T cell ratio of 1:2 and 1:4 suggesting that IDO may be partly responsible for the suppressive action of MDSC induced by catalase. However, it is likely that additional suppressive mechanism are also involved. Of note, the monocytic phenotype was conserved after catalase coculture highlighting. The use of antioxidant agents such as NAC to promote an antitumor immune response has been studied widely. However, many studies suggest that malignant cells have developed efficient mechanisms to overcome toxicity of ROS. Controlled by redox-sensitive transcription factors such as Nrf2, they may express high levels of detoxifying enzymes, most notably catalase (43–45). Hence, our findings provide a new insight potentially explaining immune evasion of malignant cells despite enhanced local detoxification of ROS. Inflammation and aberrant tissue repair, which are enhanced in malignant diseases, are associated with high metabolic activity and accumulation of ROS and consequent mechanisms of detoxification (41, 46, 47). The resolution of inflammation requires rapid fast and efficient immunosuppression to avoid bystander damage to healthy tissue. Although the enhanced expression of catalase may hence allow a tight control of the redox state, this mechanism may be nonfavorable in malignant diseases indicating a context-dependent impact of H2O2 detoxification. In summary, our findings represent a revised model of oxidative stress driving the induction of MO-MDSC with an implication for local immune regulation suggestive of a dual role for ROS detoxification. With innovative immune-based treatment approaches for malignant diseases in development, this mechanism should be considered as a possible route to enhance treatment efficiency. This work was supported by Deutsche Forschungsgemeinschaft Grant RE 2776/2-1, the Liver Foundation Trust, and the Interdisciplinary Center for Clinical Research-Trust Erlangen/Germany.
. 2009. Therapeutic targeting of myeloid-derived suppressor cells. Curr. Opin. Pharmacol. 9: 470–481.
. 2011. Myeloid derived suppressor cells in human diseases. Int. Immunopharmacol. 11: 802–807.
. 2008. A new population of myeloid-derived suppressor cells in hepatocellular carcinoma patients induces CD4+CD25+Foxp3+ T cells. Gastroenterology 135: 234–243.
. 2010. Immature immunosuppressive CD14+HLA-DR‑/low cells in melanoma patients are Stat3hi and overexpress CD80, CD83, and DC-sign. Cancer Res. 70: 4335–4345.
. 2013. Increase in CD14+HLA-DR‑/low myeloid-derived suppressor cells in hepatocellular carcinoma patients and its impact on prognosis. Cancer Immunol. Immunother. 62: 1421–1430.
. 1998. A functional model of hepatocyte transplantation for in vivo immunologic studies. Transplantation 65: 53–61.
. 1999. Liver fibrogenesis and the role of hepatic stellate cells: new insights and prospects for therapy. J. Gastroenterol. Hepatol. 14: 618–633.
. 2008. Starring stellate cells in liver immunology. Curr. Opin. Immunol. 20: 68–74.
. 2008. Hepatic stellate cells preferentially expand allogeneic CD4+CD25+FoxP3+ regulatory T cells in an IL-2-dependent manner. Transplantation 86: 1492–1502.
. 2009. Liver myofibroblasts regulate infiltration and positioning of lymphocytes in human liver. Gastroenterology 136: 705–714.
. 1994. Murine liver allograft transplantation: tolerance and donor cell chimerism. Hepatology 19: 916–924.
. 2011. Hepatic stellate cells regulate immune response by way of induction of myeloid suppressor cells in mice. Hepatology 53: 1007–1019.
. 2013. The role of complement component 3 (C3) in differentiation of myeloid-derived suppressor cells. Blood 121: 1760–1768.
. 2013. Activated human hepatic stellate cells induce myeloid derived suppressor cells from peripheral blood monocytes in a CD44-dependent fashion. J. Hepatol. 59: 528–535.
. 2001. A crucial role for CD44 in inflammation. Trends Mol. Med. 7: 213–221.
. 2003. Inhibition of myeloid cell differentiation in cancer: the role of reactive oxygen species. J. Leukoc. Biol. 74: 186–196.
. 2005. Human hepatic stellate cell lines, LX-1 and LX-2: new tools for analysis of hepatic fibrosis. Gut 54: 142–151.
. 1982. Growth of human hepatoma cells lines with differentiated functions in chemically defined medium. Cancer Res. 42: 3858–3863.
. 2013. Immunosuppressive CD14+HLA-DRlow/neg IDO+ myeloid cells in patients following allogeneic hematopoietic stem cell transplantation. Leukemia 27: 377–388.
. 1996. Priming of monocyte respiratory burst by β-amyloid fragment (25‑35). Neurosci. Lett. 219: 91–94.
. 1999. Formation of nitric oxide‑derived oxidants by myeloperoxidase in monocytes: pathways for monocyte-mediated protein nitration and lipid peroxidation in vivo. Circ. Res. 85: 950–958.
. 2013. Myeloid-derived suppressor cells suppress antitumor immune responses through IDO expression and correlate with lymph node metastasis in patients with breast cancer. J. Immunol. 190: 3783–3797.
. 1995. Activation of hepatic stellate cells by TGF α and collagen type I is mediated by oxidative stress through c-myb expression. J. Clin. Invest. 96: 2461–2468.
. 1994. Use of N-acetylcysteine to increase intracellular glutathione during the induction of antitumor responses by IL-2. J. Immunol. 152: 5796–5805. 2000. Oxidant signaling in vascular cell growth, death, and survival : a review of the roles of reactive oxygen species in smooth muscle and endothelial cell mitogenic and apoptotic signaling. Circ. Res. 87: 179–183.
. 2004. Upregulation of NAD(P)H oxidase 1 in hypoxia activates hypoxia-inducible factor 1 via increase in reactive oxygen species. Free Radic. Biol. Med. 36: 1279–1288.
. 2007. Reduced inflammation in the tumor microenvironment delays the accumulation of myeloid-derived suppressor cells and limits tumor progression. Cancer Res. 67: 10019–10026. 1996. Oxidative stress during viral infection: a review. Free Radic. Biol. Med. 21: 641–649.
. 2001. Differential expression of manganese superoxide dismutase and catalase in lung cancer. Cancer Res. 61: 8578–8585.
. 2012. Tumor metabolism as modulator of immune response and tumor progression. Semin. Cancer Biol. 22: 335–341.
. 2004. Antigen-specific inhibition of CD8+ T cell response by immature myeloid cells in cancer is mediated by reactive oxygen species. [Published erratum appears in 2004 J. Immunol. 172: 4647.] J. Immunol. 172: 989–999.
. 2006. Mutual cross-talk between reactive oxygen species and nuclear factor-κB: molecular basis and biological significance. Oncogene 25: 6731–6748.
. 2003. The anti-inflammatory actions of methotrexate are critically dependent upon the production of reactive oxygen species. Br. J. Pharmacol. 138: 501–511. 2013. Monocytes: the monocyte family tree. Nat. Rev. Immunol. 13: 549–549.
. 2010. Development of monocytes, macrophages, and dendritic cells. Science 327: 656–661.
. 2005. Catalase plays a critical role in the CSF-independent survival of human macrophages via regulation of the expression of BCL-2 family. J. Biol. Chem. 280: 41137–41145.
. 2012. Myeloid suppressor cells induced by hepatitis C virus suppress T-cell responses through the production of reactive oxygen species. Hepatology 55: 343–353.
. 2012. CD44 participates in IP-10 induction in cells in which hepatitis C virus RNA is replicating, through an interaction with Toll-like receptor 2 and hyaluronan. J. Virol. 86: 6159–6170.
. 2010. HIF-1α regulates function and differentiation of myeloid-derived suppressor cells in the tumor microenvironment. J. Exp. Med. 207: 2439–2453.
. 2009. A tissue-scale gradient of hydrogen peroxide mediates rapid wound detection in zebrafish. Nature 459: 996–999.
. 2009. Innate immunity: wounds burst H2O2 signals to leukocytes. Curr. Biol. 19: R553–R555.
. 2012. NRF2 and cancer: the good, the bad and the importance of context. Nat. Rev. Cancer 12: 564–571.
. 2010. Nrf2 and NF-κB and their concerted modulation in cancer pathogenesis and progression. Cancers (Basel) 2: 483–497. 2012. Mitochondria and cancer. Nat. Rev. Cancer 12: 685–698.
. 2012. The role of redox mechanisms in hepatic chronic wound healing and fibrogenesis. Fibrogenesis Tissue Repair 5(Suppl. 1 Proceedings of Fibroproliferative disorders: from biochemical analysis to targeted therapiesPetro E Petrides and David Brenner): S4. 2014. Role of metabolic H2O2 generation: redox signaling and oxidative stress. J. Biol. Chem. 289: 8735–8741.